Featuring an on-site restaurant and a seasonal outdoor pool this Pikeville Kentucky motel is located 7 miles from East Kentucky Expo Center. Pikeville College is 12 minutesâ?? drive away. Cable TV and an en suite bathroom are included in every budget room at the Daniel Boone Motor Inn. A work desk is also provided in the rooms. 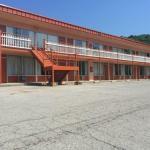 24-hour reception services are available at the Pikeville Daniel Boone Motor Inn. Free Wi-Fi and free parking are also offered to guests. Several restaurants are within easy driving distance from the motel including Renoâ? 's Roadhouse of Pikeville and Bob Evans. The Crossroads Shopping Center is half a mile from the motel. Pike County Airport is 8 miles away.